Russell Peterson is in his sixth year serving as the head coach of the Arroyo Grande high school boys swimming program. Russell enjoyed a thirteen year swimming career on the central coast. After spending seven years at the San Luis Obispo Seahawks, Russell moved to Puma Aquatics, and also swam on the varsity team of San Luis Obispo high school for four years, and was a team captain his senior year. Russell started his coaching career as the assistant varsity coach at SLO. In six total years at SLO high as a swimmer and coach, Russell helped the Tigers achieve a 35-1 Pac-7 record and six league titles from 2007-2012. 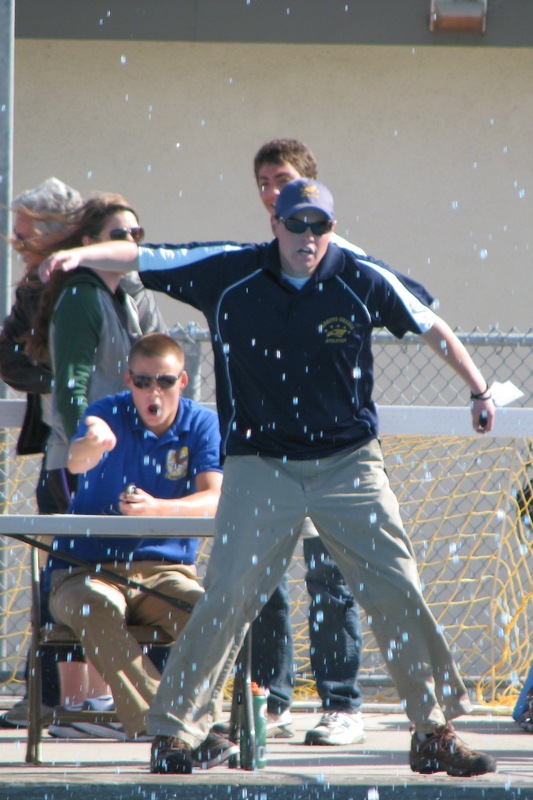 After two years as an assistant at SLO, Russell took over for longtime coach Steven Allen as the head coach of the boys swimming team at Arroyo Grande high school. In his first year, the Eagles went 7-2 (4-2 Pac-7), placed second at the Pac-7 finals, and placed third at the CIF Southern Section Division 2 championships. In the second year, AG went 7-0 (6-0 Pac-7), won the Mission Viejo invite, won the first league title in program history, and placed third in CIF-SS Div 2. The third year saw AG earn another undefeated season (7-0) and a dominating Pac-8 Finals win for a second consecutive league title, as well as a seventh place finish in CIF. The Eagle also had their 200 free relay qualify for the first ever CIF state meet. In 2016, AG once again had an undefeated league championship season and placed 7th at CIF, and qualified for the CIF state meet. 2017 saw AG finish second to Righetti in league, but the finished 8th at CIF for a fifth straight top 10 finish and made the state meet again. In all the Eagles have gone 36-3 with 3 league titles, 5 straight top 10 finishes in CIF-SS Division 2, (including two top three finishes) and three straight appearances at the CIF State meet. They have also had four individual All-Americans and two All-American relays. Every single school record has been broken during Russell’s tenure, and in total school records have been broken 36 times. Russell has been an assistant with the boys and girls water polo team since 2013 as well as the water polo club. In 2017 he became the head coach of the boys water polo program. He still swims regularly with the Masters program with the SLO Swim Club. He earned his BA in history from Cal Poly in 2016 and is now working on his teaching credential and subbing. Russell’s goal as a coach is to help his swimmers become champions of themselves. Alan was an assistant for the boys swimming program at Arroyo Grande from 2013-2017. In those five years he helped build the program into the premier high school swim team on the central coast. He served both as the JV coach and the varsity assistant, and was vital to all facets of the program. in 2018, Alan had to step away from the program due to NCAA rules, as he served as an assistant at Cal Poly that year. Alan swam for the Cal Poly swimming team for four years, which is an NCAA Division 1 program in the MPSF. Before attending Cal Poly, Alan swam for the San Luis Obispo Seahawks and Puma Aquatics. He also swam on varsity for four years at San Luis Obispo high school, and was a team captain his senior year. At SLO high, Alan became one of the most decorated swimmers in the history of the program. He broke a 30 year-old team record in the 500 free, and helped set a new mark in the 400 freestyle relay. His time in the 500 of 4:35.78 was an All-American consideration time. He twice won the team MVP award (the Black and Gold award), and in his senior year, won the Bill O’Reilly Good Guy Award. Alan was also a USA Swimming scholastic All-American. In his last two years as a collegiate swimmer, Alan has twice competed in the Pac-12 championships. He and three of his Cal Poly/SLO swim club teammates also earned the opportunity to compete in the 2014 U.S. Senior Nationals in Irvine, CA by qualifying in the 4×200 free relay.